WTI crude prices are in the range of $46.25-$46.50/b this morning. WTI opened at $46.18/b today, a drop of $0.31, or 0.67%, below yesterday’s opening price. 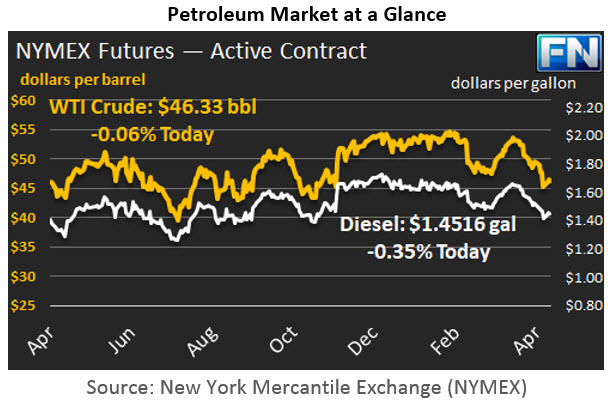 Current prices are $46.33/b, an increase of $0.45 above yesterday’s closing price. WTI crude prices had opened slightly higher on Monday and Tuesday, but prices ebbed yesterday before buying interest picked up overnight and this morning. Similarly, product prices opened higher in the past two sessions, fell yesterday, and recouped losses this morning. Diesel opened at $1.4445/gallon in today’s trading session. This was a drop of 1.45 cents (0.99%) below yesterday’s opening price. Current prices are $1.4516/gallon, a recovery of 0.95 cents from yesterday’s closing price. Despite the moderate strengthening of prices this week, diesel prices opened 21 cents per gallon, or 12.7%, lower than they were four weeks ago. Gasoline opened at $1.4849/gallon today, a significant drop of 3.85 cents, or 2.53%, from yesterday’s opening. Prices are $1.4932/gallon currently, a recovery of 0.37 cents below yesterday’s close. Over the last four weeks, gasoline prices upon market opening have dropped by a total of 27.9 cents, or 15.8%. Yesterday, the EIA released its Short-Term Energy Outlook (STEO), which flattened the recent price rally. The STEO updated its forecast of global oil demand upward by approximately 144 kbpd for 2017. However, it also revised upward its forecast of oil supply by 220 kbpd, thereby widening the supply overhang. U.S. crude production is now forecast to average 9.3 mmbpd in 2017, versus 8.9 mmbpd in 2016. Because the EIA now projects higher supply growth, it has pushed back its forecast of supply-demand balance. The STEO cut its forecast Brent crude spot price forecast by one dollar, to average $53/b in 2017, down from $54/b in the April STEO, and $57/b in 2018, unchanged from the April STEO. WTI prices are forecast to average $2/b lower than Brent prices in both years. The bearish impact of this news is being moderated by market expectations of a significant drawdown of U.S. crude and diesel inventories. 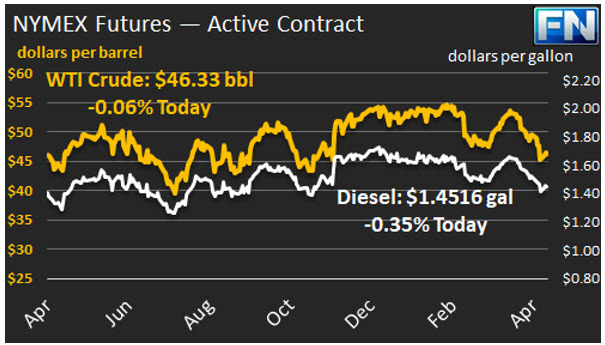 The API reportedly estimated that crude inventories dropped by a major 5.8 mmbbls during the week ended May 5th, and diesel inventories were drawn down by 1.2 mmbbls. However, the API data shows a significant build in gasoline inventories of 3.2 mmbbls, which appears to be pressuring gasoline prices down more than crude and diesel prices: Gasoline prices opened 2.53% lower in today’s session, whereas diesel prices opened 0.99% lower and crude prices opened 0.67% lower. The EIA will release official supply data later today. Futures prices also are receiving support from news that Saudi Arabia plans to cut crude exports to Asia in June to channel supply to meet seasonal demand in its domestic market.